Today I'm in Taipei, Taiwan. My luggage has been lost by JetStar and is somewhere between Singapore and here. I'm on day 3 with this outfit. Tomorrow I buy all new. The internet in Taiwan is much better than that in Cambodia or Thailand. This post is about Cambodia and my visit to Angkor Wat. Cambodia was truly the highlight of my trip so far. Getting to Cambodia is much easier than I would have imagined. The capital, Phnom Pen, has a large and established international airport, but most visitors travel to Cambodia's newer international airport in Siem Reap, the town surrounding Angkor Wat. There are several options for flying into Siem Reap. The flight from Bangkok, Thailand is about 45 minutes via Bangkok Airways or Siem Reap Airways (which are, in fact, the same airline). Alternatively, you can easily travel non-stop from Singapore on JetStar Asia, a flight taking about 2 hours. However see my comment above about my missing luggage. Flights to Siem Reap from Bangkok are about $100USD, and flights from Singapore are about $85SD (about $60USD). Pretty much all visitors to Cambodia need a visa, except those from Laos. You can purchase a visa in the airport for $20USD and it takes about 5 minutes. Siem Reap is a smallish boom town, built up around the historical sites collectively known as Angkor Wat. Angkor Wat is a specific temple, but the city of Angkor is the ancient capital of the Khmer Empire from which the Cambodian people of today are direct descendants. Within 45 minutes of Siem Reap's city center are literally hundreds of ancient and astonishing monuments built by and for Khmer kings, honoring various deities from Buddhist and Hindu religions. The ancient history of Cambodia is as seemingly checkered as its recent history; one of continuous war and conquest by the Thai (Siam) people, the Chinese, Java (Indonesia) or Vietnamese. Depending on the kings in power, the monuments were often "adapted" to reflect traditions of Buddhism, Hinduism or Taoism. Modern Cambodians have largely come to peace with their neighbors, particularly the Laotians as fellow victims of conquest. However, there is still vehement resentment against the Vietnamese. Understanding this resentment requires a bit of contemporary perspective. Cambodia won its independence from France (as part of France's vast Indochina colonies) in 1953. Established at the time as a constitutional monarchy, Cambodia quickly began to struggle against internal forces including a swelling communist insurgency. During the Vietnam conflict, American bombing campaigns pursued Vietcong forces into Cambodia and killed an estimated 300,000 Cambodian civilians as well as widely disrupting agriculture and trade, and displacing nearly a million refugees. Around the time of the fall of Saigon, communist rebels within Cambodia, the Khmer Rouge let by Pol Pot, won decisive victories including the capture of Phnom Pen in 1975. With control of Cambodia, the country was hastily renamed to Democratic Kampuchea, the proper Khmer name for Cambodia. From 1975 to 1979, Pol Pot began implementing extremist Maoist policies that included evacuating all cities and forcing all citizens into a life of agrarian labor as he viewed farmers as the true working class of Cambodia. Mass executions were undertaken against all deemed to be "enemies of the state" which included persons of education, intellectuals, those with ties to the West, the infirm, those speaking French or simply anyone with the appearance of being upper class (for example, if you wore glasses). Its estimated that in those 4 years, 3-5 million Cambodian citizens were executed - 20% of the population. The Killing Fields, mass graves outside of Phnom Pen, are shocking reminders of these brutal policies. Vietnam invaded Cambodia in 1979 to stop both border incursions and the genocide of ethnic Vietnamese inside Cambodia. Following the invasion, Cambodia fell into a long period of civil war as rival factions sought control of the country. Fighting continued until 1991 when a UN-brokered peace keeping deal settled the border disputes with Vietnam and ended their occupation of Cambodia. The legacy of these three recent decades of conflict is still evident today. As of 2006, Cambodia is estimated to have over 60,000,000 unexploded landmines within its borders. Even today, the 2.5 million visitors per year to Angkor Wat are advised not to stray from well-defined paths. The tragic consequence of this are two sobering statistics: Cambodia is home to the highest number of amputees in the world, and the highest amputee rate per capita than any country on Earth. In 2006, over 400 Cambodians were killed by abandoned landmines and unexploded ordinance, any many thousands more were maimed and injured, sadly many of them children. Further to Cambodia's struggles, the United Nations ranks countries in terms of government corruption. Out of 163 nations surveyed, Cambodia ranked 151. The income gap is widening annually, and the recent outbreak of dengue fever has cost the nation millions in dollars and hundreds of lives (Dengue fever is both easily preventable and easily treatable, but most victims seeks medial care too late or don't have the means to travel to a hospital - pennies by US standards but unaffordable to locals). All of this leaves a people resentful of their neighbors, distrustful of their government and in dire economic straights. Most Cambodians live below the poverty line, and subsist on whatever food they can produce themselves. The Cambodian currency, the Riel, currently trades around 4,000 to the US dollar. As such, all trade in Cambodia is conducted in US dollars (they use their 1,000 Riel bills as quarters). Meals in Siem Reap start about $1USD, a beer is $0.50USD and hotels can be found around $5-6. I hired a government-certified tour guide and a driver for a two-day, private tour of Angkor Wat and surrounding temples - total cost: $60. My guide makes about $90 per month. She took a certification exam and competed against 3,000 applicants for 200 positions to be directly contracted with better hotels in Siem Reap. Her English and her knowledge of the ancient history of Angkor were both impressive. In the end, I tipped her $30 which will send her daughter to private school for 5 months. At this point I'm probably not painting Cambodia as a destination high on your travel plans. However, there is much to look forward to. Siem Reap is a veritable boom town, seeking to capitalize on the absolutely amazing historical wonders. In the past 5 years, around two dozen moderate to luxury hotels have sprung up and tourism is at an all time high, exceeding the periods prior to the 1970's. Siem Reap is cheap, there is much to see, its safe for tourists, and the Cambodian people are wonderfully warm and friendly, eager to show off the area's history. A lively downtown has sprung up in Siem Reap catering to visitors from around the world. French colonial buildings as well as newer, more modern structures give the town a lot of character. Several places feature Khmer cuisine, the best of which is the well sought-after restaurant the Khmer Kitchen. We had 2 appetizers, 3 entrees and 5 beers - the check came to $9 (tip included). Khmer cuisine is combination of Chinese, Thai and Vietnamese. It features stir fry, curries and a variety of barbecued (grilled) meats. Siem Reap also has a burgeoning entertainment district along Pub Street (or Bar Street). Be sure to try the Whiskey Bucket: a plastic pale full of ice into which is poured a half bottle of Mekong Whiskey, a bottle of Coke and a can of Red Bull. Its about a gallon, packs quite a wallop and will set you back $2. (The Angkor Beer and Anchor beer, both about $0.50, are also quite tasty). Its difficult to describe Angkor Wat in a way that does it justice. The sheer size of the temples and buildings is mind-boggling enough, but you miss most of the wonder if you don't get close enough. 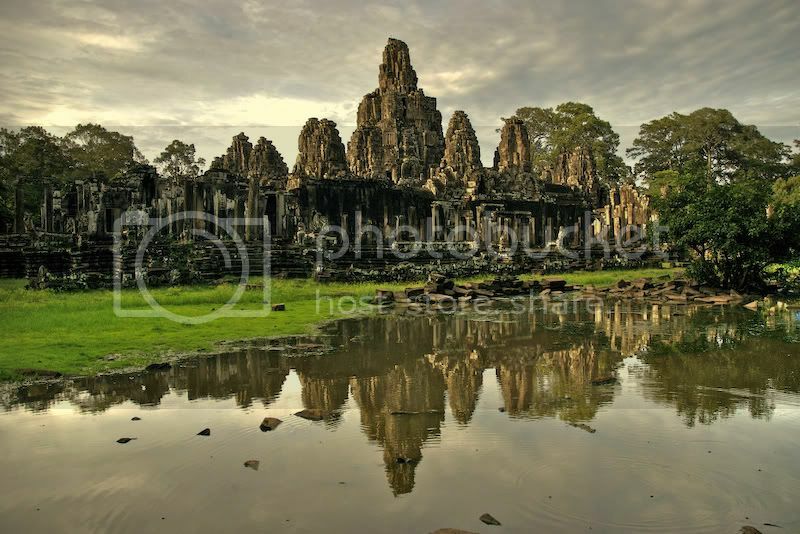 Literally every quarter inch of these massive structures, many encompassing several square miles, is intricately and expertly carved and engraved with detailed accounts of Khmer history, the teachings of Buddha and fascinating tales of ancient mythology. Angkor Wat was "discovered" by Westerners in the 1850's as the French sought a colonial presence in Indochina. In fact, much of the restoration and preservation of these monuments can be accredited to French historians. Today, Cambodia is an ill-equipped custodian of these historical treasures, and their fate rests with the goodwill of many other affluent nations to preserve these sites. I saw projects underway by the French, Germans, Japanese, Indians, British and various UN-sponsored organizations. To see Angkor properly, plan on spending 2-3 days and hire a guide. Most hotels have contracts with government-certified guides who must pass proficiency exams in both their language skills and knowledge of local history. Guides are inexpensive and are usually experienced enough to ensure you see the best of Angkor. I stayed at the Hotel de la Paix, and the guide they supplied was terrific. The hotel had great food, but venture out and sample the local fare. Ask the drivers, bellhops and waitstaff where they like to eat - those are often the best recommendations in any town you're visiting, in the US or abroad. The picture at the top is Angkor Tom at sunset. The Buddhist monk was photographed at Angkor Wat, the second photo and most famous site in Cambodia. The photo of the tree's massive roots overtaking the temple known as the Tomb Raider Tree is another famous vista from Cambodia. Finally, the bottom photo is me making friends with the locals by handing out some cheap Japanese candy. My guide told me the kids love the candy from "outside" as it is so much better than local sweets. All of the tourist spots are crowded with vendors, many of them children, selling handmade items. They love to practice their English and will happily tell you the capital of any US state you name. I didn't buy much of what they were selling, and I certainly wouldn't categorize it as "crap" like you find in many of these places. These kids are working hard to make a living, while also going to school, in a country that has nowhere to go but up. When you offer them a piece of candy they look really conflicted: you're not buying what they're selling, but they do love candy - just like all kids do.